We investigated the influence of gadolinium (Gd)-based upconverting nanoparticles (UCNPs) on water spin–lattice relaxation (T1) and diffusion at different magnetic field strengths (0.4 T and 9.4 T). Our findings show that smaller NPs (12 nm compared to 19 nm) were more favourable for proton relaxivity. We also demonstrate that using simplified Solomon–Bloembergen–Morgan (SBM) model we can associate two measured diffusion coefficients with processes occurring near the surface of UCNPs and in bulk water. Using the relationship between relaxation and diffusion, we can estimate not only the total impact of NPs on relaxation of water molecules, but also the impact on relaxation of local water molecules, directly connected to paramagnetic Gd3+ ions in NPs. 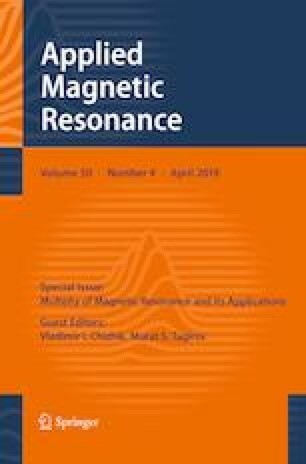 Different magnetic field strengths did not alter the spin–lattice relaxivity of NPs. This suggests that Gd-based UCNPs could be developed into high-performance multimodal magnetic resonance imaging contrast agents working over a broad range of imaging field strengths used in clinical routine. One of us (K.K.) thanks for the hospitality of Prof. Dr. Stefan Jurga group in NanoBioMedical Center, Poznan, where the part of the experiments were carried out. Special thanks to Dr. Grzegorz Nowaczyk for the TEM measurements and Prof. Dr. Vytautas Balevicius and Laurynas Dagys for their help during the experiments and discussions.